How It Should Have Ended: Papal Conclave edition – What's Up With Francis-Church? Qui nomen sibi retinuit Benedictum. Remember that sinking feeling? That whisper in the back of your brain, “We’re toast.”? It was too soon. Two days and only four ballots. Something was up. So, there I was, sitting in the office about 7 o’clock, transcribing a video for a story with the headphones on. 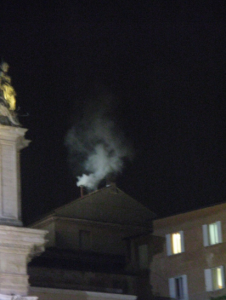 At five past seven, I thought I had better go down to the Piazza to watch for the smoke. When I took off the headphones I heard the bells ringing. But it was too early, four ballots, so I still wasn’t convinced until I got down to the street and saw people running. I ran the two or three blocks to the Holy Office entrance and climbed over a barrier into the Colonnade. The cops had been stopping people today and making a half-hearted effort to check bags, but now weren’t really bothering to stop anyone and a lot of people were just climbing over the railings to get into the Piazza. I managed to push my way fairly close to the front, just to the left of the Loggia and stopped just behind a group of Eton-accented seminarians from the Venerable English College. We chatted a bit but mostly people were quiet. Some Italians sang a patriotic song for the Italian Republic, apparently unaware of the irony. At “Habemus Papam” I fulfilled one of my lifelong Catholic wishes, and, together with 150,000 other people, punched both fists in the air and cheered, and chanted “Viva il Papa! Viva il Papa!”. I suspect it will be the last time for a long time. After that, one of the VEC boys said it all seemed surreal. It was. When the announcement came it all seemed rather perfunctory. None of the dramatic pauses. Tauran came out quickly, said the famous phrases and was gone almost before we’d had a chance to cheer. Then we knew. Argentina. A Jesuit. 76 years old. Bergoglio. Francis “the first”. But it all seemed so strange. So perfunctory and abrupt. There had been none of the drama, the pauses, the acknowledgement of the crowd’s response. As though the whole business had to be got over with quickly. Before anyone had a chance to get their bearings, Tauran had gone. Some Italians tried to chant the new papal name, (which is how many of us learned what it was) but it just didn’t seem to work, and the effort trickled down and died. Then another moment and the crucifix appeared followed by a tall, erect man in white. At first glance I was reminded of Pius XII. But again it was strange. 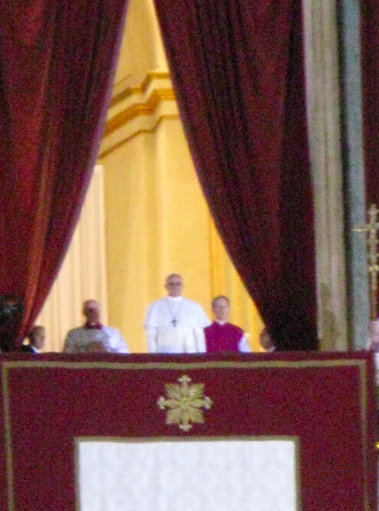 He was in papal white, but not in choir dress. There was no apostolic stole. No red mozzetta. And he simply walked towards the railing of the Loggia and for a long moment just stood still, his arms straight at his sides. The crowd’s cheering seemed to elicit no response at all. He was silhouetted against the light coming from behind the curtains and he seemed, simply, unmoved. After his rather flat greeting, that included a joke, the only other huge cheer came at the mention of the name Benedict. After that, it was a relief to pray. A moment of silence came which was almost eerie. Have you ever been shoulder-to-shoulder in a crowd of 150,000 people and heard total silence? I’m not sure there is any experience like it. At that moment, a little thunder rolled distantly. The VEC boys and I were the only ones to kneel for the Apostolic Blessing. Then there were a few more words, and the new pope simply turned around and left. People were left in the square for a few minutes, standing rather stunned. I’m not sure they were happy, except perhaps because the whole strange affair was over. But I had already started working my way back through the crowd towards the Colonnade before Francis I had finished. I’ve written here and elsewhere about the grave feeling of disquiet and foreboding that descended on me on the morning of February 11th. The conclave was conducted under a pall of gloom. The weather was awful. Cold, rainy, drizzly. On the morning of the Mass, it hailed. This morning the sun was shining again. The news kiosks are piled high with Italian papers bearing the photos of a strange face, a man in white. Smiling. Of course, there will be lots more, and I’m sure that I’ll have a lot to say once the surprise wears off. But for now, all I’ve got is my gut, which tells me that last night was going to be the last time for a while that I will be standing in St. Peter’s Piazza cheering.